TP Poseidon's Elin is a treasure trove chocked full of valuable genetics! She is a Caligula's Accoyo Poseidon daughter and her dam brings 4Peruvian Legacy, Snowmass White Gold, Chaccu, Snowmass Congalli Gold and Snowmaster into the pedigree. This elegant blend of genetics has produced Elin who has a wonderful blend of qualities from these spectacular bloodlines. She is conformationally correct with an excellent bite. 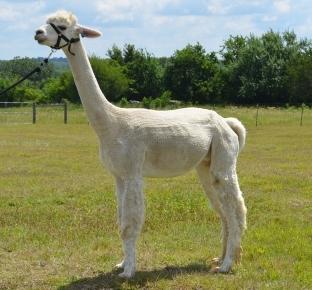 She is an elegant, stylish female with a wonderful fleece. She is very fine with a soft, silky handle. In addition, she has the density and fiber characteristics of brightness, bundles and tight crimp. Elin has been selected to be part of the foundation or core of our "Elite" herd based on her EPD's, Skin biopsy results, and her conformational traits. Elin was biopsied as a 3 year old white female with ARI#31724845. Her 15 X scan shows large fiber clusters uniform shape and placement but sometimes irregular in size. Her density is 80 follicles SQ MM of skin with an S/P ratio of 14.2 to 1. Her 250X scan shows level 4 of 4 glands which should relate to fiber brightness. Virtually none of her secondary fibers are medullated which should relate to excellent handle but I might question if her excellent density was appreciated in the show ring. 100 secondary fibers average 16.9 microns while 50 primary fibers average 23.7 microns for a spread of only 6.8 microns.